Kaidee Akullo, outgoing president of the Black Student Union at Fort Lewis College, leads a Martin Luther King Jr. Day march across campus. 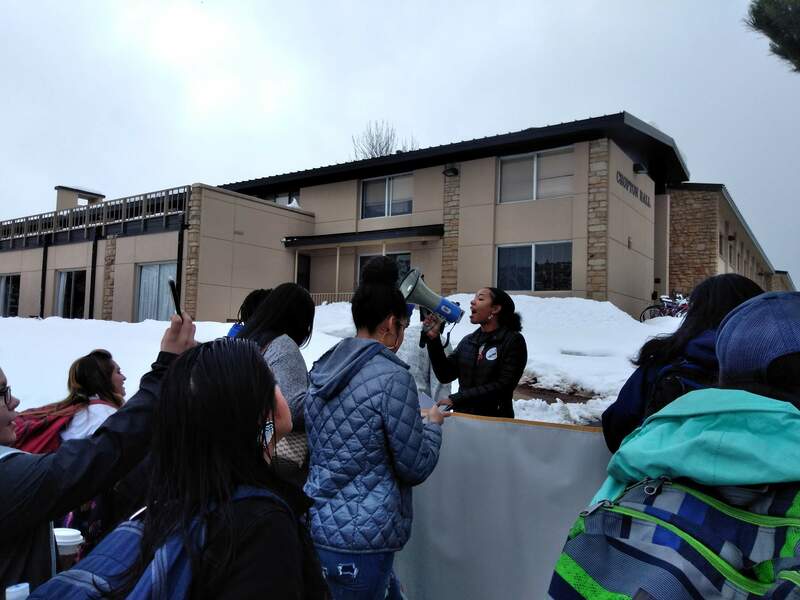 A blustery, cold day with a few flakes of snow in the air didn’t dissuade about 200 students from rallying and marching across campus at Fort Lewis College to honor Martin Luther King Jr.
“I challenge you to honor Dr. King by always doing what’s right,” Kendall Sconiers, treasurer of the Black Student Union, told students, faculty and staff who gathered in the Student Union after the march to remember the civil rights leader in speeches. 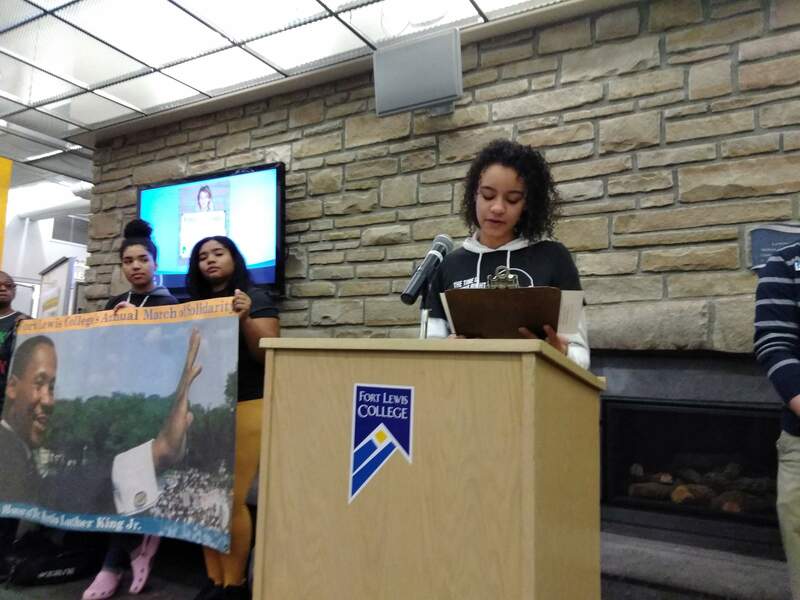 Kendall Sconiers, treasurer of the Black Student Union at Fort Lewis College, challenged students to always do what’s right during her speech celebrating the life of Martin Luther King Jr. Throughout the day, workshops about social justice and talks about creating a dialogue to continue King’s work to achieve racial equality were held in the Student Union as part of a celebration of Martin Luther King Jr. Day. Workshops included presentations by faculty members who recently visited the U.S.-Mexico border. Faculty members discussed what they found at the border as immigrants seeking asylum arrived, and they answered questions from students. The current state of the Black Lives Matter movement and how it can be supported.LGBTQ students and their experiences and how they could receive more support.How FLC could be more supportive of all minorities, whether racial, gender or religious.Students could also hear an audio of King’s “I Have a Dream” speech, with the words highlighted in captions, including the deletions King made from his prepared text. Kalina Cross, also an incoming co-president of the Black Student Union, said receiving recognition on campus means a lot to black members of the FLC community. “We only have one staff member and one faculty member on campus, just being recognized means a lot,” she said.